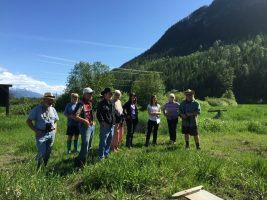 Every year CMI members get together to provide updates on their projects such as local research, field trials, new initiatives in southeastern British Columbia, etc. This event ‘travels’ around the Columbia Mountains area to small communities to give us a chance to catch up on each others’ news. It’s an informal atmosphere and non-CMI members are encouraged to join us! Our 2016 event took place in in Kaslo, BC and included a fabulous line up of speakers, two great field trips, and a short and sweet AGM. PHOTO: Field trip to Halleran’s Wetland, the largest wetland conservation project on private land in western Canada. Thank you to Hamill Creek for your sponsorship of this event’s coffee break.